Chili Peppers	| Grilled Chicken – Indoors! In large glass bowl combine all of the vegetables. Add remaining ingredients and mix well. Add 1/3 of the mixture to a food processor and blend until smooth. Combine puree with original mixture. Chill for 4 hours and serve. Sounds like a delicious pairing gazpacho and Caravella! Kathy you rock. the ingredients in this look delicious, but I am not a huge fan of gazpacho. Is there a way to make this soup hot? I have just added a (hot!) Tomato Soup to my blog that you might like to try. Also if you check the index there are several soup recipe photo-tutorials as well as some soup videos! Wow, this looks soooo yummy! I’d never thought about serving a refreshing cocktail with a refreshing Gazpacho. Perfect for a hot September evening! Thanks Kathy! All the Farmers Markets seem to be bursting with fresh produce! We still have a few more weeks of great tomatoes before all the apples and pumpkins start arriving! So until then, I’m enjoying the last hurrah of summer produce! I made this soup over the weekend, as an appetizer a a dinner party I was having with friends and it was delicious. What was also a big hit was the Caravella Limoncello cocktails along side. The weather is still nice and warm, and it was a nice way to make everyone feel like summer is still here! This soup is great for entertaining. It is even better when made a day or two before your party. Plus, it is so tasty no one will realize how really healthy it is as well! Soup and a Limoncello cocktail sound like a great time to me! The absolute BEST gazpacho I ever ate was just a few months ago in Barcelona. It was smooth and creamy and layered with amazing flavors. They served finely diced tomatoes, peppers and cucumbers as a garnish. It was fantastic! I must admit that I’ve cheated when I’ve made gazpacho in the past…. I’ve just use my food processor to do the work for me. 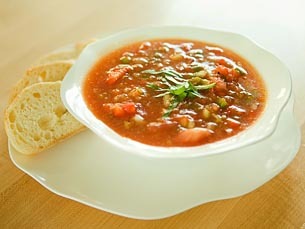 Gazpacho is a tasty treat with fresh tomatoes, now that they are in season. Truth be told, I use my food processor for almost everything! I have discovered that most beginner cooks own a blender and not a food processor. Consequently I have never shown a recipe here a startcooking using my trusty food processor. I do hope that once people develop confidence in the kitchen, they will think about purchasing a food processor. They are well worth the investment! This looks wonderful!!! I have never had gazpacho but will give it a try when my tomatoes are ripe. Like our videos? Subscribe for free! A cold soup is often what we need on a warm summer day. So join startcooking in preparing gazpacho. This cold soup is easy to make. Think of it as liquid salad. And it will make friends and family happy because everyone likes to enjoy a bowl of gazpacho.